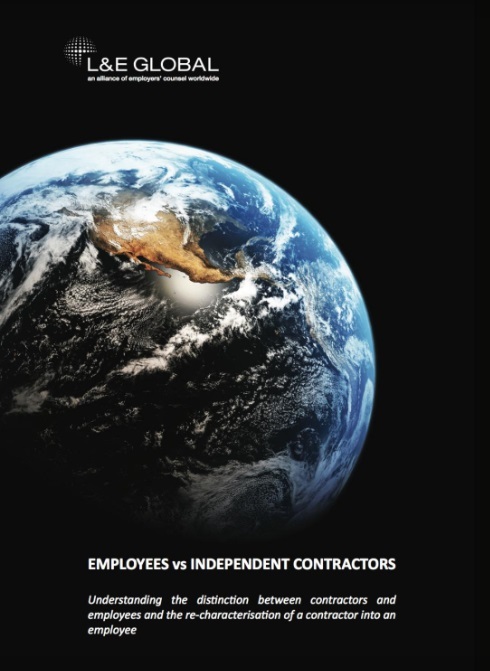 With our clients in mind, and to help them through the labyrinth of the modern workforce with different approaches in different jurisdictions, L&E Global is proud to present our 2017 Global Handbook, which serves as an introduction to the complex issue of employees vs independent contractors, with analysis from 32 key jurisdictions, across 6 continents. For the 4th year in a row, L&E Global has published its annual global handbook especially for our valued clients. Since we last touched upon the issue of employees vs independent contractors and the consequences of the re-characterisation of a contractor into an employee back in 2014, there has been a universal effort to eliminate “sham” contracts, which seek to hide the true nature of the relationship as an employer and employee agreement. In recent years, the use of independent contractors has increased significantly. There has also been an increase in the use of fixed-term contracts, temporary commercial agency agreements and labour outsourcing services. This trend is not without its risks. The rise of the on-demand sharing economy (online business transactions) in areas such as carpooling, apartment/home lending, peer-to-peer lending, reselling, co-working and talent-sharing and the enterprises that drive these new workforces, has led to an increase in litigation, with the qualification of the contracts and work agreements as the central issue. For employers with operations in multiple jurisdictions, successfully entering into a working relationship, whether with an employee or an independent contractor, is a very real challenge and one that impacts every sector of industry, in every region of the world. If you wish to receive your personal hard copy version, or if you have any questions, please contact us directly at leglobal@leglobal.org.